Radishes grow quickly, from seed in ground to ready to eat in less than a month. There are bigger radishes that take longer and have a really string bite but most people are more familiar with the red ones, the Cherry Belles and the French Breakfast. Homer has been setting seed with his Speedy Seeder almost every day. To test what will grow and germinate in winter, and to stop weed growth inside the hoophouse. Radishes are the perfect thing to work with. Thousands of seeds in a pack for a few dollars. Dinners now, on a regular basis, consist of many greens. 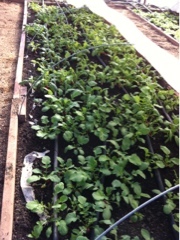 Lettuces, spinach, kale, collards, Swiss chard, mustard. Radishes, carrots, onions, garlic along with butter, salt and pepper go into the oven until tender and hot, then right over the greens. A dressing of honey, mustard, olive oil, hot peppers that we grew last summer, dill, chervil, parsley fresh from the garden. A fantastic mix that, as Homer says, the more goes in the better it tastes. No bugs in the greens. Slugs are on holiday. 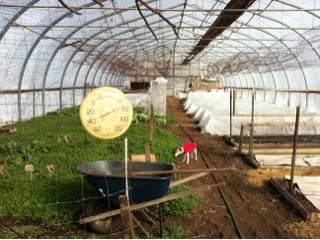 Yesterday, in the sunshine, the hoophouse was warm and tropical. For a small window of time it feels like Florida out there!